In this post, we penetrate router to test DoS attack. The main objective of this post is to make the WiFi router more secure. So at the hacker and security perspective i am going to show you how to perform DoS on WiFi router and how to Secure it from these attacks. Before performing DoS attack, first task is to identify all the open ports. Here i am only showing the TCP ports. Remember: When doing any testing of router. Don't forget to test UDP ports also. Because sometime UDP ports also reveal much information which is very helpful to craft further attacks. Image 1: The following image shows that DoS protection is disabled on the router. On the right side the information is given for all security features present in this page. See the below image to understand more about it. Now before moving directly to the attack, the below screenshot will display the scenario. On the right Kali Machine is the attacker from where we are going to perform DoS attack. 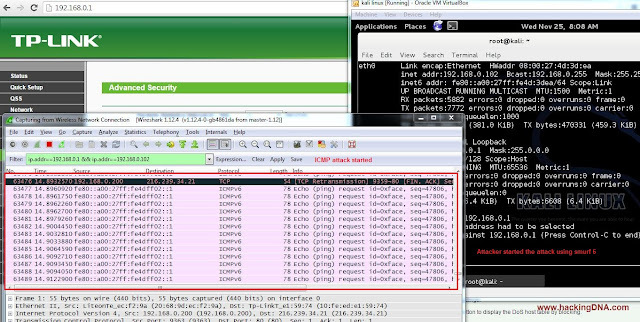 Below is the wireshark is running to see the packets travelling on the interface. And at last on the left, TP-Link service is running on the browser (port 80). Kali Machine: DoS attack is started using smurf6. It floods the target with ICMPv6 protocols. 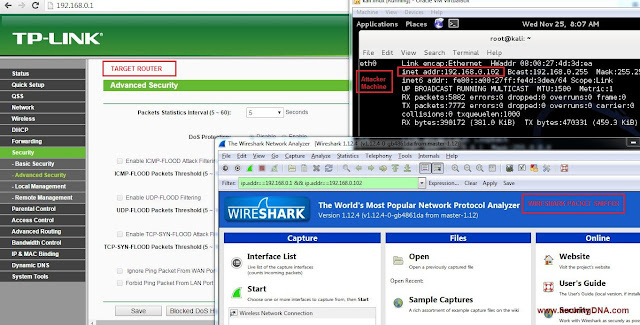 Wireshark: On the Wireshark, observe flooding is going on which is enough to take the router down. TP-LINK: At the back router web page is running. After the successful attack, observe that router webpage is not available because the target is down. This attack is successful in this scenario when DoS protection is not enabled on the router. Now we are going to protect the router from DoS attack. After check all the security options, we can save our router with these attacks. The below screenshot shows after running the smurf6 attack, still the router is working. It is a security that protects device from many attacks and host detection on the network. At this level we can put some security by isolating WiFi router. Although it a small level of security, but useful to protect device sometimes. Remember: Don't forget their are other ways to identify the host in the network. Image 1: No security options is selected to isolate WiFi router from the network. In this post, we penetrate the TP-LINK wifi router at the DoS level. Practically we perform DoS attack on the WiFi router. Which shows how we can take down the router and also how to protect it using TP-LINK security features. Also we perform TCP scan using nmap (network mapper tool) to identify the target open ports at the very first of the post. At the end, we also use TP-Link ping forbidden features, to make router security more harder atleast for some level. If you are planning to purchase a TP-Link router or any other router always read the manual specially the security column. And buy a secure router which gives protections from these attacks. One more thing at the last this target host is not mine. This whole testing done after bypassing authentication of the Wifi router. This shows that how vulnerable still our cities WiFi and what are the areas we all (Penetration testers or normal users) have to focus to make router secure.